138 • RV PRO • September 2018 rv-pro.com O R I G I N A L E Q U I P M E N T As an added bonus, the material also is ideal for counter- tops, he adds. Sika's flooring is ideal for use on all crafts, from skiffs to luxury sailing yachts, from powerboats to cruise liners and from tankers to fast ferries, Buraczewski contends, so why not RVs, too? 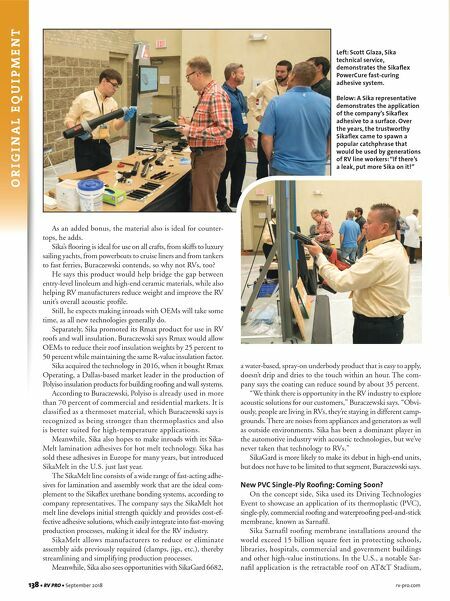 He says this product would help bridge the gap between entry-level linoleum and high-end ceramic materials, while also helping RV manufacturers reduce weight and improve the RV unit's overall acoustic profile. Still, he expects making inroads with OEMs will take some time, as all new technologies generally do. Separately, Sika promoted its Rmax product for use in RV roofs and wall insulation. Buraczewski says Rmax would allow OEMs to reduce their roof insulation weights by 25 percent to 50 percent while maintaining the same R-value insulation factor. Sika acquired the technology in 2016, when it bought Rmax Operating, a Dallas-based market leader in the production of Polyiso insulation products for building roofing and wall systems. According to Buraczewski, Polyiso is already used in more than 70 percent of commercial and residential markets. It is classified as a thermoset material, which Buraczewski says is recognized as being stronger than thermoplastics and also is better suited for high-temperature applications. Meanwhile, Sika also hopes to make inroads with its Sika- Melt lamination adhesives for hot melt technology. Sika has sold these adhesives in Europe for many years, but introduced SikaMelt in the U.S. just last year. The SikaMelt line consists of a wide range of fast-acting adhe- sives for lamination and assembly work that are the ideal com- plement to the Sikaflex urethane bonding systems, according to company representatives. The company says the SikaMelt hot melt line develops initial strength quickly and provides cost-ef- fective adhesive solutions, which easily integrate into fast-moving production processes, making it ideal for the RV industry. SikaMelt allows manufacturers to reduce or eliminate assembly aids previously required (clamps, jigs, etc. ), thereby streamlining and simplifying production processes. Meanwhile, Sika also sees opportunities with SikaGard 6682, a water-based, spray-on underbody product that is easy to apply, doesn't drip and dries to the touch within an hour. The com- pany says the coating can reduce sound by about 35 percent. "We think there is opportunity in the RV industry to explore acoustic solutions for our customers," Buraczewski says. "Obvi- ously, people are living in RVs, they're staying in different camp- grounds. There are noises from appliances and generators as well as outside environments. Sika has been a dominant player in the automotive industry with acoustic technologies, but we've never taken that technology to RVs." SikaGard is more likely to make its debut in high-end units, but does not have to be limited to that segment, Buraczewski says. New PVC Single-Ply Roofing: Coming Soon? On the concept side, Sika used its Driving Technologies Event to showcase an application of its thermoplastic (PVC), single-ply, commercial roofing and waterproofing peel-and-stick membrane, known as Sarnafil. Sika Sarnafil roofing membrane installations around the world exceed 15 billion square feet in protecting schools, libraries, hospitals, commercial and government buildings and other high-value institutions. 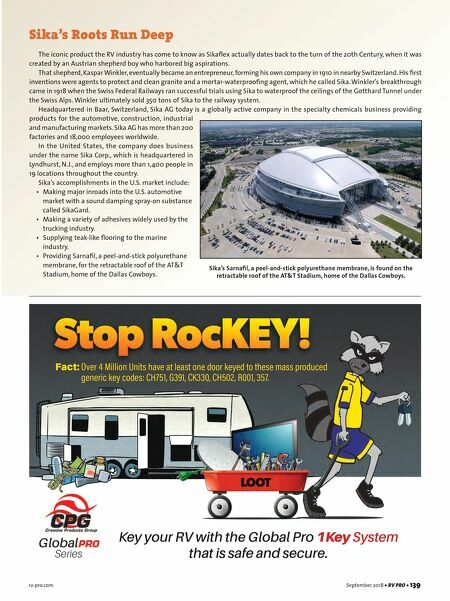 In the U.S., a notable Sar- nafil application is the retractable roof on AT&T Stadium, Left: Scott Glaza, Sika technical service, demonstrates the Sikaflex PowerCure fast-curing adhesive system. Below: A Sika representative demonstrates the application of the company's Sikaflex adhesive to a surface. Over the years, the trustworthy Sikaflex came to spawn a popular catchphrase that would be used by generations of RV line workers: "If there's a leak, put more Sika on it!"